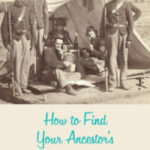 Digging into military records can yield an incredible amount of information about our ancestors. (My favorite is my 3rd-great-grandfather’s Civil War pension file. It showed that he married his second wife 12 days after she divorced her previous husband. Yeah, that.) While some records will spell out military service, there are times when we need to tease that fact out. 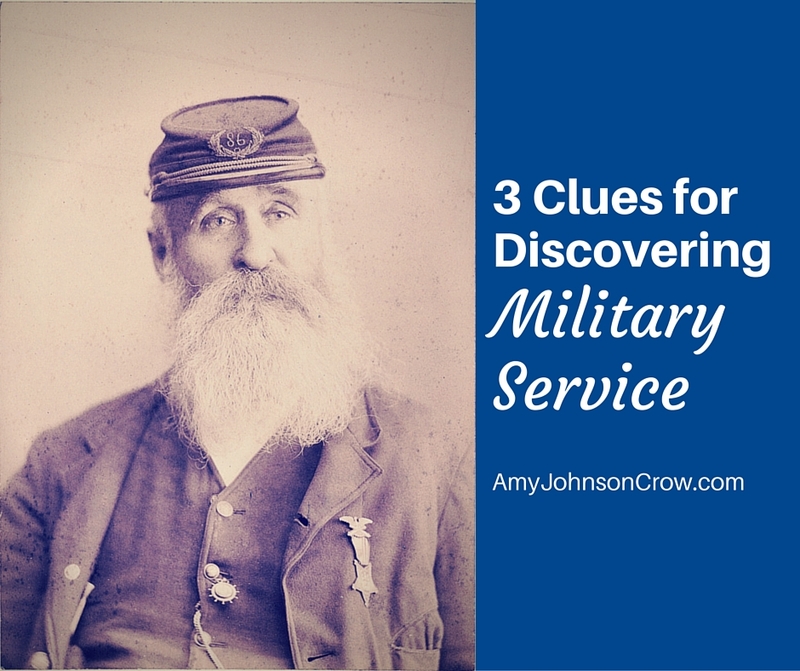 Here are 3 clues to look for to discover your ancestor’s military service. Henry Clay Ruby’s obituary doesn’t come out and say that he was a Civil War veteran. However, it does state that he was a member of the O. P. Morton post, Grand Army of the Republic. The GAR was an organization comprised of honorably discharged Union veterans. 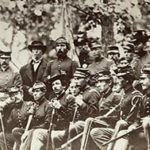 Knowing about the Grand Army of the Republic gives us the clue we need to start exploring Henry’s Civil War service. 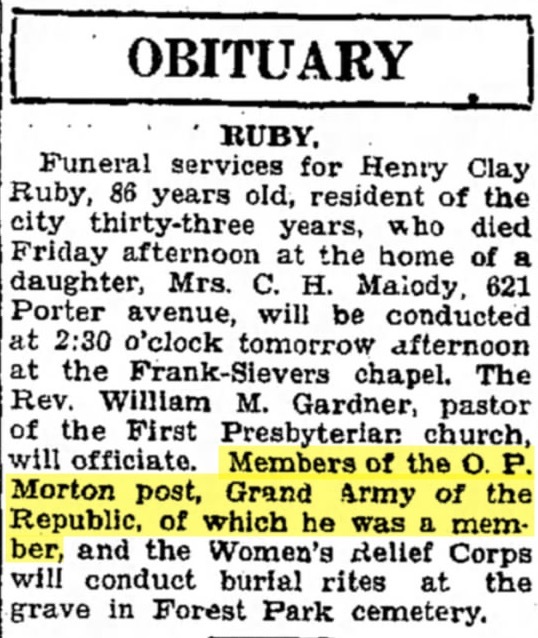 Henry Clay Ruby obituary, Joplin Globe, 27 January 1929, page 6. Image courtesy Newspapers.com. Not all information on tombstones is words and numbers. Not to sound like The Da Vinci Code, but there can be meaning in the symbols. Look for things like crossed swords, crossed flags, cannons, etc. One symbol that often isn’t a clue to military service is the anchor. An anchor on a tombstone is often used as a symbol of hope. When you’re looking at the 1910 census, be careful, as the Census Bureau also used those right-hand columns for statistical notations. The 1840 census listed Revolutionary War pensioners by name and age. There’s also the 1890 Special Schedule of Union Veterans and Widows. What’s been your best military discovery? 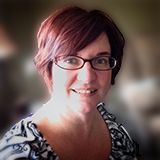 This entry was posted in Military by Amy Johnson Crow. Bookmark the permalink. My problem is more recent. WWII when my father served. Apparently his records were lost when an Army warehouse burned down. My dad passed in the late 70s before I knew to ask & Mom isn’t much help. Are there any avenues of research? Yes, there was a fire at the National Archives facility in St. Louis in 1973 that destroyed a large amount of WWII-era records for the U.S. Army. Not everything was lost, but you will need some information before you can start to try to access what remains. Do you know your father’s unit? Look on any of his military papers that you might still have. Also, try contacting the courthouse in the county where he was living when he was discharged. He was supposed to have filed a DD214 (his separation papers). There should be information on that as well. Don’t overlook newspaper research, especially if he lived in a small town. Local newspapers loved to run stories about hometown boys who were serving. Good luck! Thanks for this info. Unfortunately I have no papers therefore, no clue as to his unit etc. I will check out the papers tho. Be sure to check with the courthouse where he was living when he was discharged. They should have a copy of his separation papers. Good luck! Also the VA is a good place if the member was injured they may have information on file as they did for my Father. It’s my understanding the DD214 forms survived the fire. I would go to the national Military Personnel Center and see how and what you can order. My father-in-law’s records also burned but we still were able to get his DD214 and a list of medals and awards he received. I know there is a group that is still trying to restore those records. I met a woman that does this work. She may be retired but the email address for her ended in Nara.gov. The awards we got after sending our fathers 180 & discharge papers are priceless to us. I sent her an email but if I do not hear back then I’d ask your Senator. I hope these clues might encourage you in the search. This was a great hint. I will be mailing out that request this weekend! Just some further comment… My father was Navy, but I was able to get not only a copy of his entire military record, including Muster Rolls, but also was able to apply to get any medals that he was awarded or that his unit/ship was awarded. Found out my father did some cryto work, which he never talked about! And the file even included a letter from his mother to the President, asking for him to be allowed to get leave to attend his brother’s ordination in the Jesuit Brothers! (The request was denied by the Navy). The Navy records for WWII are no longer at the National Archives but were transferred to specific Navy Archives a few years back, from what I understand. The 1930 US Census in questions 30 and 31 ask whether the person had served in army or navy, and in what conflict. Some of the State death certificates, such as in Pennsylvania, also ask whether the person had served in the military, and collect service information on the back of the certificate. 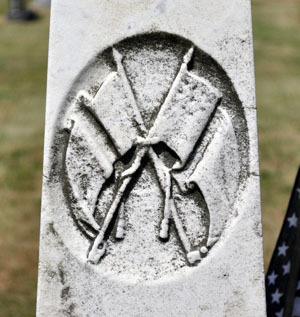 A wide variety of entities have compiled data about gravestones of veterans, ranging from DAR chapters to old-settlers associations. 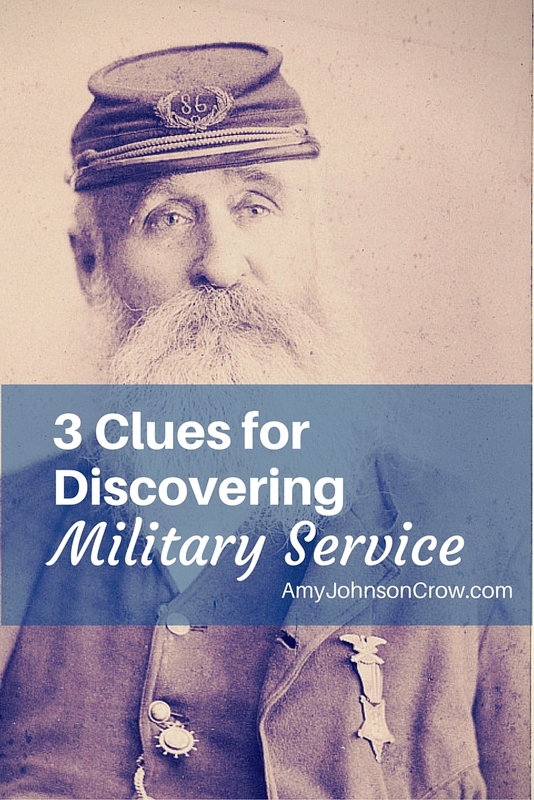 These lists and databases are to look for, if your relative was of an age to have served. Good preparation is to have a list of wars where a relative may have served, from King Philip’s War onward. It takes little time to compare a birth date against such a list, remembering that the person might have claimed to be a bit older than actual, in order to serve. Enlistment bounty money and military pay were often incentives. thanks for the clue on pa death certificate reverse. To answer your question: what did “you” find? In a War of 1812 folder, I discovered that a man who had disappeared, assumed dead, was actually living in a distant state and was married. . . again. He was committing bigamy which was discovered when both widows applied for a pension. Those two applications sent a NARA archivist into a tizzy. In the end, his first wife was entitled to the pension even though she had killed him off in the Family Bible with his date of death as the day he left. Wow! What an interesting finding. Sounds more like a movie! During WWII, because of a heart murmur my father served in the Coast Guard Reserves in Philadelphia. I have a book with what appears to be his flotillas. How do I get more information? Hi, Barbara. I’ve never researched the Coast Guard Reserves, but I did find some information on the Coast Guard website: http://www.uscg.mil/history/faqs/Genealogy.asp Don’t be alarmed by their suggestion that you contact the National Personnel Records Center in St. Louis. Though that agency had a disastrous fire in 1973, the losses of WWII-era documents were mostly Army records. Good luck with your research! To locate your father for WWII just send the request to see what they have if at all. Although the fire burned many records they initiated a reconstruction act to rebuild their records. I worked for the NARA at one time. I copied my dad’s records and sent them in to put back in his file. The charred remains were not thrown all thrown away. It is a time consuming process, but they were trying clean up what they could and put back the remains in their personnel files. One day I will go to Missouri to go and see in person. I have a great-grandfather who had an alias. There are 2 pension cards showing this. He applied for his pension in 1925, after his wife died. I don’t think anyone knew his name was changed, as he told stories about his parents and childhood that weren’t true. 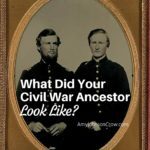 He served just after the Civil War, but the problem is that the National Archives say that The VA has records from pensions from that time, and the VA does not indicate they have the pension file…they are so huge that I have no idea where to begin. I’d gladly pay for the file if I could locate it. PS: He died in 1931. I would try contacting the VA again. Be sure to indicate that you’ve already contacted the National Archives and that you were told the VA has the file. 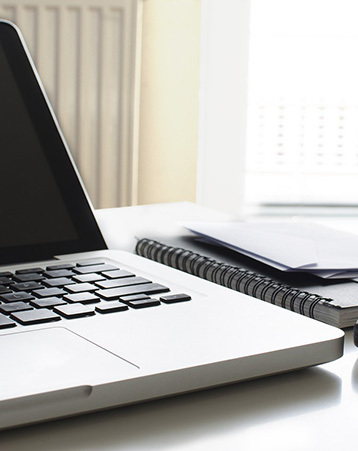 Include the pension certificate number and/or the application number. Sometimes the VA will send back the standard “we don’t have the file; NARA does response” if they think you haven’t contacted NARA first. Good luck! My best find came from a pension application for the Indian Wars. The amount of information in that application was amazing! How can I find records on my father, William Donovan O’Hara’s, Korean Conflict records? He died in 1980, there is no one left in the family to help with this. I know that he was in the Air Force and flew on bombing missions. He also flew entertainers to perform shows for the troops. Years ago I saw a newspaper article that talked about his plane being one of the few that returned from a large mission. The article was shown to me by his brother who lived in the Los Angeles area. All family is now dead and all memorabilia is lost. I’ve come up empty on all my searches. He was stationed in Japan in 1952-1953. Do you have any idea where I should be looking? My grandfather was in the calvary (yes!) and fought in the US-Mexican War/conflict on the boarder of Texas. I cannot find any records about this war let alone records for my grandfather. I do know he was an officer and served his time and they called him back to train troops. His name was William Frederick Pyle. At the time, he was either living in PA or NJ. Thank you. The National Archives should have his service record. I forgot to ask from my previous message – do you know how or where I can find information on the Mexican War? You mentioned that he was living in PA or NJ at the time. Google or use WorldCat.org to look for a roster of Pennsylvania or New Jersey units. I found out that one of my great-grandfathers served in WWII in the Navy when I was going through old family photos that one of my uncles scanned in. I was labeling them with names and places when I found several of him in uniform! Then a quick search on Ancestry also revealed that he was in the Marine Reserves in the 30’s, then married his first wife, then joined the Navy shortly after Pearl Harbor! My father and I never knew until now. Something to try to ask my grandmother about! That’s great! Definitely something to ask your grandmother about! Our family story is that great-grandpa Collins fought with the Union in the Civil War, but his unit (division?) was not released at the conclusion of the war. They were to be sent West to fight Indians. He said he had enough of fighting and went absent without leave. He is said to have changed his first name, moved to Iowa, and became “someone else.” He married after the war, so I can’t find his earlier name through marriage records of his wife. In old age, he refused to apply for veterans’ pension, still afraid of being caught and punished. His birth name died with him, so I can’t find him, or his ancestors before the war. He may have been born in Missouri. Are there desserter records? 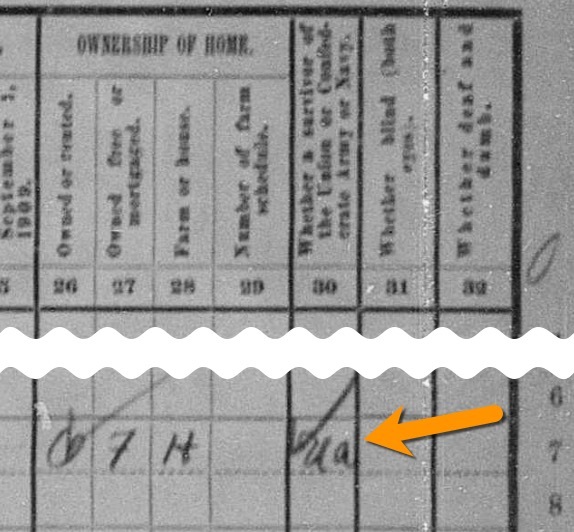 On the 1910 census for Davenport, Iowa; column 30 for him, it says “7-” What does that indicate?